Not everybody wants a large trampoline that may be too big for the little space they have in their homes. Sometimes, the most ideal choice is a portable trampoline which may be more convenient and suitable for your environment. There are different types of mini trampolines perfect for small families who do not have enough space to keep a large size model. If you are looking for a mini trampoline, there are so many options available for you. You just need to consider the ones with the right features that are very durable. After series of research, we have come up with the 10 best mini-trampolines in the market. Below are some descriptions of the features and benefits of these high quality trampoline products. Suitable for: Stamina’s 36 inches foldable trampoline is one of the best trampolines available at present. It can be conveniently stored in a very small place when not in use and can carry a weight up to 250lb. Durability: It stands on 6 detachable rubber tipped legs and consists of a safety pad. This trampoline is a heavy duty one and tension resistant and made up of steel, making it rust free and durable from all aspects. Benefits: The rebound surface is apt for cardio workouts and in the leisure can be used by kids also, if you wish. Warranty: It comes with a warranty of 90 days from the manufacturer on all its parts. Benefits: This pure fun 9005MTH Trampoline is specially designed for those who wishes to keep fit by doing jumping exercises regularly at home. It is available at a reasonable price and can be stored in the assembled as per convenience. You have the facility of an adjustable handrail which can be used in the process of your cardio. This trampoline is solely for fitness purpose and generally not recommended for kids below the age of 12. This Pure Fun Mini trampoline makes your cardio and fun regime. Suitable for: The trampoline can withstand about 250lb and stands of 5 supporting legs and it itself weighs only 20lbs. Durability: This Pure fun mini trampoline unlike the 9005MHT does not contain handrails but is a very safe and efficient fitness accessory. It is made up of 36 heavy duty steel springs and extra soft padded cover for tension resistance and shock proofing. The rebound surface is made of propylene making is durable, strong and elastic. Dimension: It is about 8.5 inches in height and weighs about 15.8 pounds. The rubber tip hardened steel legs are easy to attach and detach hence making it easy to assemble as well as store while not in use. This trampoline is available online and is inexpensive. Benefits: This Sunny health and Fitness trampoline is very useful and the bar makes it easy and convenient for all age group of users. The bar is adjustable and one can decrease or increase it as per requirement. We call it a perfect cardio, rebound instrument which you can own just at a minimum price. It is foldable and the free carry bag that comes along with it can easily be carried around and assemble anywhere in no time. Suitable for: It can carry about 250 pounds and the rebound strength is based on 32 metallic springs attached to it. Benefits: This Fitness product is one of the most stable of its kind. It makes use of a trampoline rebound surface for various kinds of exercises and cardio workout for daily fitness regimes. The handrail makes it easy to balance and there is also a special electronic device which tracks the jumps per minute, the calories burnt, the total time and the number of jumps in that time. It is somewhat motivating for the user going about the regime. Structure: This JumpSport Trampoline is a very classy looking Trampoline with arched legs supporting it from 4 sides. This trampoline is used for jumping freely and the padded rebound surface makes it even more comfortable and fun. Here is another high quality trampoline that is portable and also affordable. It weighs about 220 pounds and is solidly built to help you perform any sort of trampoline trick. This is a great tool to help anyone who wants to work out through rebounding. It has a very high lift and can even serve those practicing for competition. If you don’t have enough cash to spend on a large size trampoline, the Urban Rebounder is a great option to consider. It has a very high user rating on Amazon and has received lots of recommendations from customers who have actually used the product and seen the overall benefits it provides. This is probably the most efficient and most robust mini fitness trampoline you will see in the market today. It has a nifty design that enables it to be easily folded in quarter or half for easy storage. It has several features that make it stand out among several other mini trampolines. With a carry bag, a stabilization handle bar, and a jumbo shape, you can’t possible see another mini trampoline with all these features. 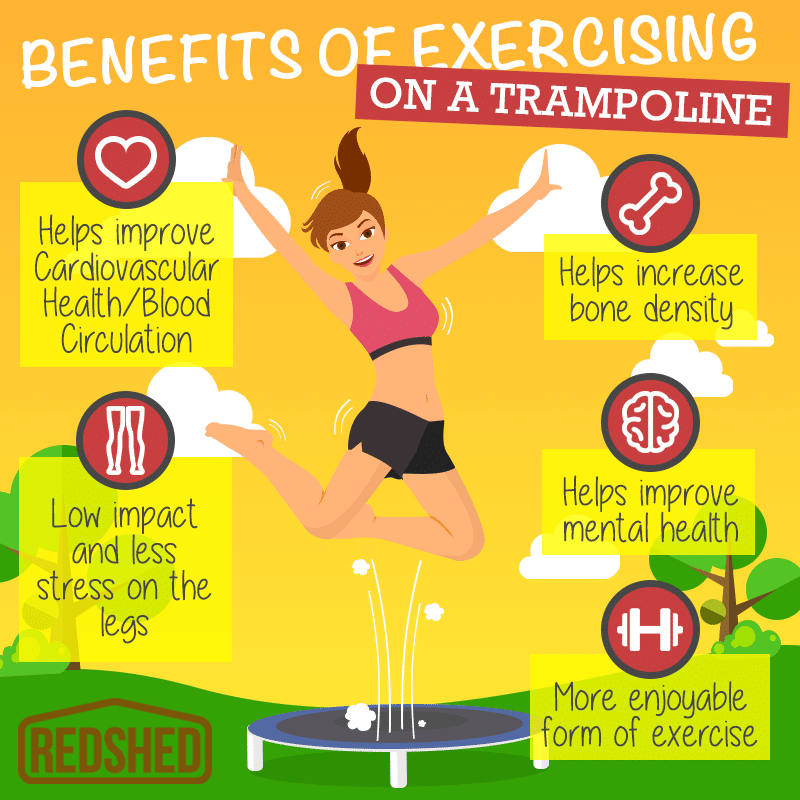 This trampoline provides a low impact, which is suitable for those who want to stick to basic exercise regimens. It equally comes with a DVD with 3 progressive workout routines for professionals, intermediate learners, and beginners. Maximus Pro has detailed information for those who want to challenge themselves doing comprehensive stretches and core workout for maximum impact. This is the number one product on the list because of its extreme durability and portability features. Having this trampoline will give you and your kid great fun. It has a simple but rugged design with elastic band technology that makes it stand out among several other types of products. One unique feature of this trampoline is the durable woven polypropylene that covers the outer frame and elastic bands. It equally features a steel frame with removable legs that can be unscrewed for easy storage. The AirZone mini trampoline is a great product for low impact exercise and cardio fitness. It feels so easy on the joints and supports users of about 200 pounds and people of all ages. Mini trampolines are great for those who want something portable and those who only have little space in their homes for a trampoline. They provide an avenue for sport loving individuals to keep fit without necessarily going out to workout. The above mini-trampolines have the highest quality and have lots of customer reviews on Amazon. If you are looking for the most ideal trampoline for your convenience and workout needs, consider any of the above options and you will be rewarded with efficiency and long lasting service. I didn’t want to get a rebounder with the springs because I’ve heard of horror stories where the springs popped off and flew everywhere! So, I bought the Stamina 36 inch rebounder which has a 250 lbs max load. I have had this for a couple of months and nothing has broken yet. I weigh around 180 pounds and I find this very sturdy and quality rebounder for the price. Rebounding is no doubt the best ways to get into shape and have an absolute blast while doing it. I have the JumpSport 250 trampoline and it is very well built. It has elastic cords and the model has good warranty coverage on it. It was easy to put together….just screw the legs on to the main body and you are ready to jump. I have the jumpsport 250i and loved it, at first. I have owned it for less then a month and have already been snapped in the Legg 5 times by 2 cords. I am way under the weight limit and the company will not give me a clear answer on why this is happening. At this point I will be returning the product. I now need to purchase a new fitness trampoline but I am nervous about hassling with ano there low quality product. Any recommendations? I hope you had a great breakfast and come back often to our websites! I work hard at the content. Thanks for letting me know you like my hard work and the team I work with! I have recently purchased Jumpsport 250 after reading your review. I must thank you for that. I received the product and it is wonderful. Thanks for your wonderful comment! Glad you are happy with your Jumpsport 250 trampoline! We are not in the trampoline business. We write reviews. Sorry.